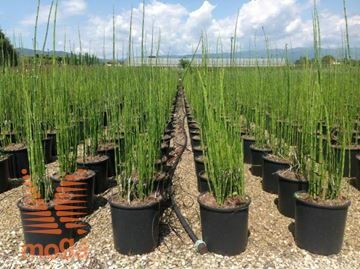 Equisetum japonicum Description barred horsetail Description Medium-sized, upright, fast growing, deciduous aquatic plant, perennial (H 70-100 cm, W 30-50 cm), spreads well. Stems rounded in cross-section, upright, green, not branched or with sparse, uneven side-stems. Side-stems in whorles, green. Grows in shallow water (up to 20 cm deep), tudi in marshy soils. Standing or running water, sites for true water plants. Water plants can be either attached to ground or free floating, submerged or floating on surface. They cannot tolerate drought, even with muchwatering they cannot grow in a garden bed for a long time. Some water plants may grow partly (or for some time, if water level drops) on land, where they develop different growth and different leaf shape.